ASEAN stands for Association of Southeast Asian Nations. It is an organization with interests in politics as well as economics. Its intention is to boost its members’ economic growth and bring about stability. The countries which are within the ASEAN group are currently: Indonesia, Malaysia, Philippines, Singapore, Thailand, Brunei, Laos, Myanmar, Cambodia, and Vietnam. ASEAN has much to discuss with countries such as the Philippines and Vietnam having a growth rate of approximately 6% or higher. The World Economic Forum predicts that by the year 2020 the region will be the fifth largest economy in the world. Together these 10 countries bring about a strong economic force together which unites to form a destination for investment. Why should Businesses Expand into ASEAN? The region’s combined population of 634 million is the third-largest in the world, after China and India. Due to its dense population and economic growth, there are more active consumers within the region. It is estimated that ASEAN’s consumer market is close to about U.S $ 1.6 trillion which surpasses countries such as India at 938 billion and South Korea at 590 billion. 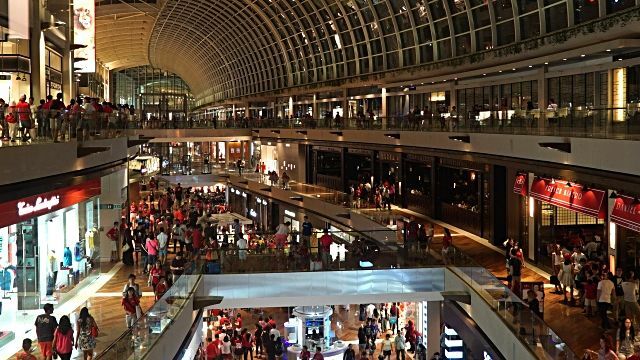 With a growing middle class, this a usual day at one of the shopping malls in Singapore. Not long ago, many of the countries within the ASEAN region was found to be emerging markets. Since then, there have been some countries which have performed well into mature markets. This, in turn, is able to support a large and growing middle class which also ties into the earlier point of larger consumption. ASEAN has been able to get into Free Trade Agreements (FTAs) with a few Asian countries such as India and China as well as other non-Asian countries such as Australia and New Zealand. This allows for a reduction in tariffs to be paid which in turn leaves a better margin with the reduction of the cost for businesses. Chinese factory workers laboring in haste at one of Apple’s production plants. Undoubtedly China’s days of cheap labor are numbered as the country is experiencing a rising level of the middle class. Some of the countries within the ASEAN region have a lower labor cost in comparison to China. The average cost of factory labor in China is $28 a day, whereas in ASEAN countries like Vietnam it is $7 and $9 in Indonesia. Trade is the corner-stone of ASEAN nations economies. ASEAN as a collective region is ranked the 6th largest economy in the world and in terms of the population, it would be considered the 3rd largest in the world. These numbers are intended to grow as there are talks in terms to increase the number of member countries. One of the main dealers who benefit from ASEAN is the Chinese market which has a bilateral trade agreement; ASEAN being Chinas 3rd largest trading partner. One of many picturesque destinations within ASEAN. ASEAN over the recent years has been surging with their tourism industry. These members’ nations are gaining traction within their tourism sector. However, they lack in funding and resources to reap the benefits of providing products and services. Investors could involve themselves in order to look at the ASEAN market as there are many untapped opportunities. The year 2015 showcased that nearly 108,000 tourists had traveled within the ASEAN belt. Did you know that more than 80% of the world’s hard drives are made in ASEAN? The technology industry has advanced from the production and innovation of ASEAN nations. Due to this, they have been able to better integrate their products to serve markets such as China and Japan. China’s interest for consumer electronic parts has sparked ASEAN’s semiconductor supply network, while Vietnam has seen a noteworthy capacity as it turns into the agent of choice for Korean producers. ASEAN nations such as Cambodia are packed with untapped natural resources. In relation to natural resources, the ASEAN countries offer many valuable resources. Take Laos as an example – this country is one of the poorest within the region. However, its GDP is soaring due to the extraction of its natural resources such as gold, lead, agricultural products and more. Laos has also the capability to tap into hydroelectric power. These two element accounts for 80% of the country’s foreign direct investment from countries such as China, France, and Japan. Hayleys Advantis goes beyond borders. The transportation and logistics wing of the Hayleys Group has already taken the plunge into the market of Myanmar by entering into a joint venture with company Kusuhara Transportation Do Ltd. from Japan and Myanmar Sedate shipping and logistics Co Ltd. Being the largest private sector bank in Sri Lanka the company is renowned for its expertise in micro-finance. The company expanded their reach overseas to Cambodia and acquired a majority stake in PRASAC Microfinance Institution limited, one of Cambodia’s largest microlender with an asset base of U.S $ 1.3billion. After this successful acquisition, the company then had bought 60% of a company known as Thanakea Phum (Cambodia) Ltd, which was then renamed LOLC (Cambodia) Ltd. This turned out to be the fifth largest micro largest regulated microfinance institution in Cambodia. Jetwing Symphony plans to flap its wings after its done feeding. The recently turned public limited company has had a strong positioning within Sri Lanka and it hopes to expand into the ASEAN region. Jetwing Symphony has set their sights on countries such as Vietnam, Laos, Myanmar, and Cambodia. They hope to make the leap into these markets as soon as the constructions of their impending 7 hotels in Sri Lanka are complete. The reason as to why these countries were chosen is because they are similar to Sri Lanka in terms of culture and products. In conclusion, ASEAN can be the next gold mine for businesses of Sri Lanka to expand either through their existing businesses or to look into businesses that are already booming in ASEAN, which they can inject capital for. However, this should be looked at more of a long-term investment rather than expecting short-term rewards. If you are interested to explore potential business opportunities for Sri Lankan businesses from ASEAN, make sure to reserve you and your colleagues a few seats at the ASEAN – Sri Lanka’s Next Big Opportunity event scheduled to be held on the 11th of June 2018 at Shangri-La Hotel, Colombo. You can reserve your seats HERE. 1) Douglas Lippoldt – Chief Trade Economist in HSBC Global Research, HSBC London.